Asian economies especially India and China have emerged very rapidly from the global financial crisis. While the developed economies are struggling, developing economies are showing very strong growth. The economic centre of gravity is shifting to the emerging economies. There is an increasing level of self-confidence and plenty of new opportunities. India has to grow its GDP @ 10% plus level to alleviate poverty and make a transition from a developing to a developed economy. This means that we need all round growth in agriculture, manufacturing and service. Finance minister Pranab Mukherjee has envisaged investments of $1 trillion between 2012-13 and 2016-17. McKinsey estimates that India will need to build a city of the size of Chicago every year to accommodate the hundreds of millions of people who will be migrating to cities in the next 2 decades. Financing this growth is a big challenge. Indian Capital Markets – The Next Big Thing? The systems continuum was followed by the Finance continuum. 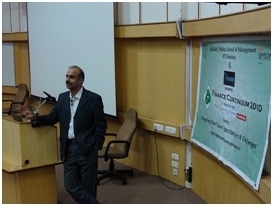 As India grows rapidly, and financing this growth seems to be a big challenge, The Finance Continuum in association with State Bank of Hyderabad discussed the theme "Financing the Future: Opportunities and Challenges" on 26th September. The event was inaugurated by Mr.Dharmakirti Joshi –Chief Economist at CRISIL and Mr. Anand Bajaj Group Executive Vice President & Chief Innovation Officer,Yes Bank. 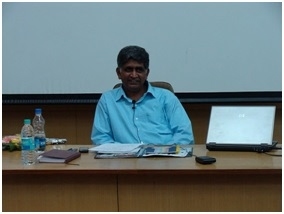 Mr. Dharmakirti Joshi set the tone of the event as he discussed about the global economic landscape and compared India and China’s growth story. He talked about how Asia’s outlook has improved as Asia drives the world out of the recession. Checking the optimism in the audience, he also discussed the risks and challenges ahead emphasizing on the issue of Financial Inclusion. 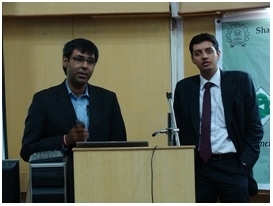 Taking from there Mr. Anand Bajaj, talked about Innovation of Mobile Money & Future of Banking Services. He discussed how collaboration between Telecom Company, government and banks is driving a new open financial ecosystem of mobile banking which shall make the FI s reach the bottom of the pyramid. 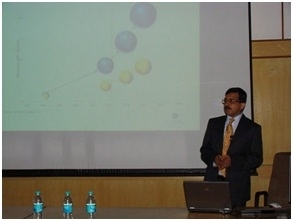 Later, Mr. Gopakumar Putenveettil - President of ICICI Securities, discussed Equity Capital Markets. He talked about the changing trends, growth drivers and challenges ahead for the market. 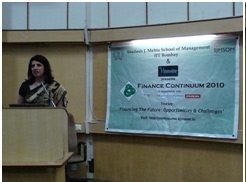 Also, Ms. Latika Kundu – Executive Director, MCX’SX talked about Potential and opportunities of Capital markets. Pointing out that even after 20 years, our capital markets had similar limitations of low investor population, underdeveloped debt market, and need for SME exchange as in 1991,she discussed the vast opportunities Indian capital markets have. Mr. J. Niranjan – Head of Investment Banking, Tata Capital discussed the Indian Growth story & how it affects Investment banking. He talked about the immediate governance issues in India and also highlighted how growth shall lead to huge availability of money in Indian markets and hence more M&As. Mr. Rahul Shukla & Mr. Parag Wagh, representing Corporate Banking division of Citibank, talked about how M& A s are becoming instrumental in building Indian MNC’s . inclusion. 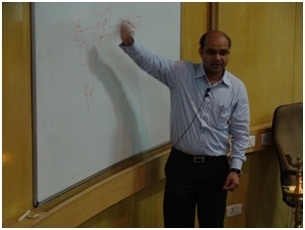 All in all it was a very enriching and interactive session. Exchange, Career-Journal, CoolAvenues, Dare2compete, Twenty19. 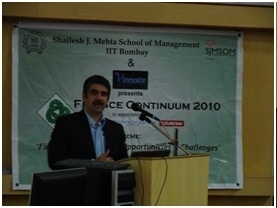 With the end of Finance Continuum, it was the end of the very successful Continuum series 2010 that saw participation from alumni, industry and students from IIT B community and other B Schools.